I received five sets of water decals from Nicole Diary to review and I am pretty excited about it because ever since I tried nail wraps I have been wanting to use more products like this! I've been attempting to mix in other nail art techniques rather than just stamping, and these are way easier than making decals on my mat. I chose a lot of retro florals because that's one of my things, and this week a new texture came in just in time for #texturenailluminati. 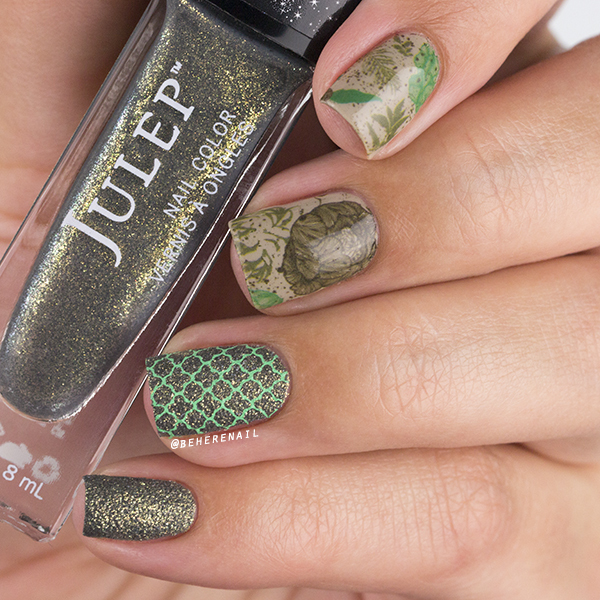 It's Julep Lydia, pictured here with the rest of my inspiration including Zoya Misty, MdU Spring Green and the lovely water slide decals. I have never used this type of water slide decal before but they were so simple and forgiving. There are ten wraps in a package and they are quite long, so if you have short nails like me you might be able to do two nails with one decal! I had absolutely no issues applying them and the best part to me was that unlike wraps I have used in the past, these did not require a layer of topcoat in order to stick to the nail. They applied directly to my dried nail and clung just fine with plenty of time for adjustment without the risk of drying clear polish smearing or dissolving it. I can't tell you what a relief that was. I applied topcoat delicately and generously and there was no melting or tearing. Plus, take a look at how beautiful. I love the colors in this mani. Zoya Misty, a dusty grey/green khaki makes a perfect base for the water decals and the shimmery texture of Lydia makes an eye catching accent. I want to say it's an olive green, but it's one of those pyrite-like grey bases with gold shimmer that ends up looking green. I have a couple of shades like that but among my textures this is so very unique and I have my bestie Delia to thank for it. I did end up adding a drop of MdU Green to my Spring Green to help it match the decals and just blended them on the plate with my scraper. 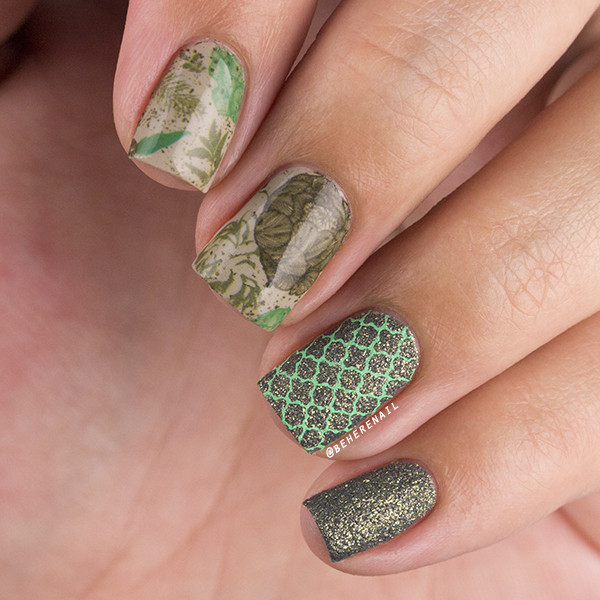 That classic pattern is from UberChic Beauty Collection 3, and it's one of those images everyone needs in their life. I hope you guys like this mani and if you're wondering where you can find these lovely decals check out Nicole Diary on AliExpress, Amazon or Instagram. If you add my code Jus2016 to the notes section of your order you will receive a free gift! Here are a few more pics before I go. I am going to have to go check yours out! It's so fun to see what everyone is doing with these decals! Thanks Lili!